Carina distance from near-infrared photometry of RR Lyrae stars. We present distance modulus to the Carina dwarf spheroidal galaxy obtained from single-phase near-infrared magnitudes in the J– and K-band for a sample of 33 RR Lyrae (RRL) stars. The sample was carefully chosen from data published by Dall’Ora et al. (2003, AJ, 126, 197), who provided also RRL pulsational periods. Carina galaxy. 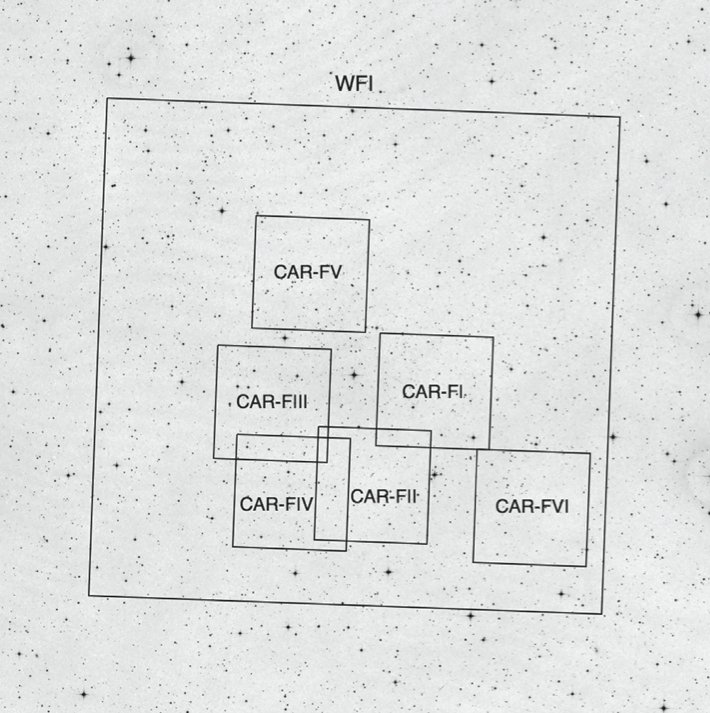 Six fields observed with HAWK-I infrared camera (mounted on VLT telescope, Paranal, Chile) together with one filed observed with WFI camera and used in study of Dall’Ora et al. (2003, AJ, 126, 197) to determine pulsational periods of RR Lyrae stars therein. Overlapping areas share 33 RR Lyrae stars which were used in our study to derive distance to the Carina galaxy. Near-infrared (NIR) photometry of RRLs, while minimizing the influence of both interstellar extinction and metallicity on the RRL luminosity, reveals a linear relationship between the luminosity and the metallicity and the logarithm of pulsational period, i.e. the PLZ relation. We used five semi-theoretical and empirical, J– and K-band PLZ relations from the literature (Bono et al. 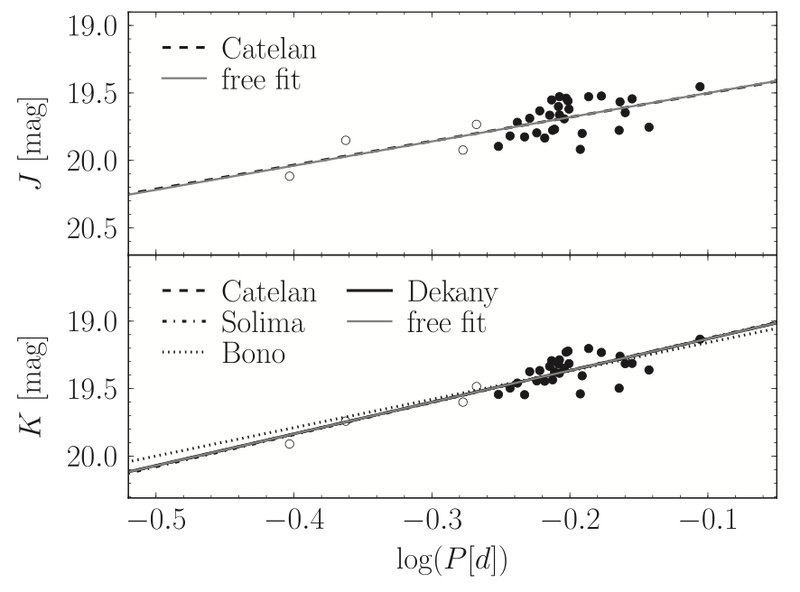 2003, MNRAS, 344, 1097; Catelan et al. 2004, ApJS, 154, 633; Sollima et al. 2008, MNRAS, 384, 1583; Dékány et al. 2013, ApJL, 776, L19) in order to perform the linear least squares fitting with a slope value fixed. This way, only one parameter – zero point of the calibration – was free, and therefore the uncertainty of the entire fit could be substantially reduced. Apparent magnitudes of Carina RRL stars (RRab – filled circles, RRc – open circles) as a function of their log pulsational period. Lines denote different slopes of PLZ relations exerted from the literature. The observed scatter is related mostly to the single phase nature of our photometry. The zero point of the calibration, corrected for the effect of metallicity and interstellar extinction (both from literature), yielded the true distance modulus of 20.118 ± 0.017 (stat.) ± 0.110 (syst.) mag. True distance moduli determined from different calibrations. The average foreground reddening E(B-V) = 0.06 mag towards the Carina galaxy was calculated using reddening maps from Schlegel et al. (1998, ApJ, 500, 525). Our results are consistent with other distance determinations obtained within the Araucaria Project from NIR photometry of red clump stars (20.165 ± 0.015 mag) and the tip of red giant branch (20.09 ± 0.03 ± 0.12 mag in the J-band, 20.14 ± 0.04 ± 0.14 mag in the K-band), as well as with most independent distance determinations to the Carina galaxy. The NIR RRL method once more proves to be a reliable tool for accurate distance determination at the 5% level or better, particularly for galaxies and globular clusters that lack young standard candles, like Cepheids.